No better views in the Rockies !! This beautiful two bedroom, two bath Snowscape condo, borders and has an unobstructed view out over Arapahoe National Forest and the Ten Mile Range. It is home-away-from-home with comfortable furnishings, wood burning fireplace and a well stocked kitchen. The on-site clubhouse has an indoor pool, sauna, hot tub, and game room . The master bedroom has a queen bed and the second bedroom has two twins. The living room has a firm pull out queen sofa-bed to sleep 2 children, for a condo total of 4 adults +/- 2 children . NB: Google photo of this address is in total error. The condo has cable "smart" tv, CD and DVD player, and free wireless internet. Parking is ample in front of the condo. The mountain views from the deck off the living room are majestic. The kitchen has everything you need. The fireplace is a real wood-burning fireplace, not gas, with firewood provided. Located just 3 miles from shopping and restaurants and 15 minutes to major ski resorts, this condo is on a free county-wide shuttle bus route. Countless 4 season adventures, activities, and solitude. You will love this condo and this location---cozy, inviting of endless gazing or adventure, and a great value. World class skiing is available at Copper Mountain, Keystone, Breckenridge, A Basin, and Loveland, all within 14 miles. Vail and Beaver Creek are an easy 30 mile drive. IAlong with easy access to amenities and activities this unobstructed view and location next to Arapahoe National Forest give the feeling of seclusion without inconvenience. The silence from the deck, view of the beaver ponds below, and the occasional moose or fox walking by will remind you that you are secluded in the Rocky Mountains. In winter, in addition to the skiing/boarding resorts, there are groomed and ungroomed cross country areas as well as snowshoeing on the many, many miles of nearby and far-flung mountain trails and bike paths. Several of these hiking trails are accessible right from the condo year-round. During the other three seasons, fishing, golf, sailing on Lake Dillon, exploration of the region's historic gold and silver mining areas, gorgeous drives, art shows, concerts, shopping, and so much more are available for all ages. Its location right on a free county-wide shuttle allows group members to pursue separate interests but begin and end the day together. Very close to groceries, varied restaurants, and all services. Note: Photo Google search produces for this address is in total error, i.e. is not NOT our property, is not this address. Unobstructed view out over Arapahoe Natl Forest and Ten Mile Mtn Range through full-glass deck-end of living room and from master bedroom through both its windows. Land line for local calls. Heat coils in floors and baseboard electric radiant heat. Located in the clubhouse (on site but not in the condo itself) . Abundant parking immediately adjacent to condo. Free wifi with excellent reception. We have 2 types: traditional Mr. Coffee type and Keurig type. 50" smart flat-screen TV on widely adjustable large wall arm. With unobstructed mountain view out over Arapahoe National Forest and the Ten Mile Range. Copper Mtn (12 miles), Keystone (7), Arapahoe Basin (11), Breckenridge (14). Vail + Beaver Creek (32mi) west on I-70, Ski Cooper (35) in Leadville, Loveland Basin (12),Winter Pk+Mary Jane (52). This is our 4th visit to Snowscape, and as usual, it was excellent. New beds, a new Keurig machine, and plenty of firewood!! Great view. Clean and well equipped. Owner is very nice and pleasure to work with. Great and well maintained condo. Owners are very attentive. The condo is well equipped. Perfect location for skiing Keystone, Arapahoe, Breckenridge, Vail and Beaver Creek. 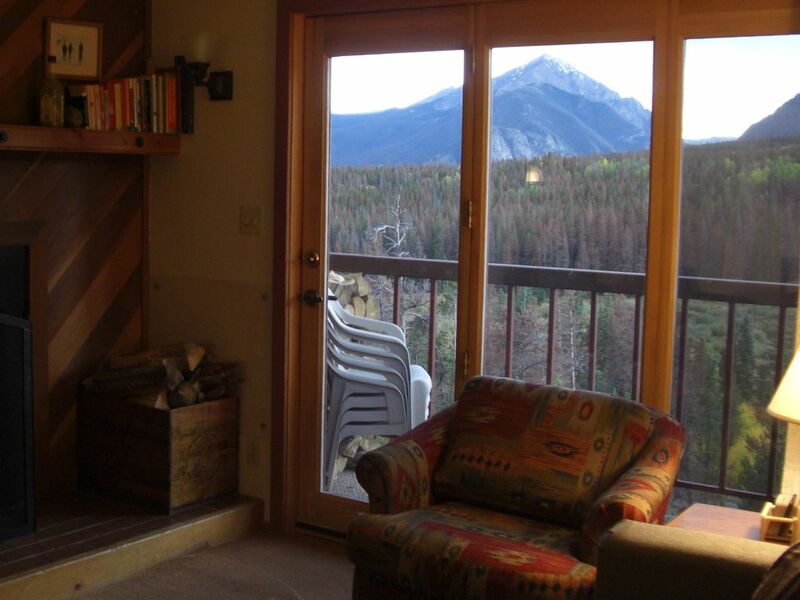 We love this mountain condo and have been returning for many years! It is sparking clean with a lovely fireplace (wood provided). I have recommended it to a number of friends. The owners provide outstanding customer service. Our group thoroughly enjoyed skiing and tubing at Copper Mountain. Several of us did shopping - both for groceries and small art pieces. Stores are convenient and well stocked. The view from this vacation home is stunning.-- pine forests, wild life and Buffalo Mountain. We can't wait to return next year! We just stayed here for 4 nights over MLK weekend. It was the perfect place for me, my wife, and our 2 teenage kids! Great location for bouncing between all of Summit County’s ski resorts. The pool and hot tub building are an easy / quick walk away. The views from this unit really are amazing. And working with the owners was simple. They put a wonderful and personalized touch on our stay. Thank you Liz—We’ll be back. Snowscape was as advertised: well maintained, well equipped, and the owners could not have been more attentive. We will be back! Silverthorne is a town in famous Summit County, Colorado. Snowscape condos in the Wildernest development offer a great location and a break from the expensive on-site resort pricing. You will love being located on the edge of Arapahoe National Forest and steps away from great hiking trails...yet also only a few moments from the all the amenities and activities of Summit County. Summertime brings festivals, free concerts, Farmer's Markets, biking, hiking, fishing, golfing, sailing, history-buffing, rock climbing, and much more. Winter fun at Keystone, Copper, Breckenridge, Arapahoe Basin, Vail and Beaver Creek ski areas is endless and includes downhill skiing, alpine skiing, traditional cross country and skate cross country skiing, tubing, ice-skating, sleigh rides, and easy entry into back-country skiing. $100-200night $250 refundable damage deposit required. Checks and credit cards accepted (for non HAway guests) Stays of 3 or fewer nights pay a $90 cleaning fee; others free. State and local taxes are added at 6.375% For adults (at least 30 years old) seeking longer term rental pls contact owner Liz at 617-877-7997 or snowscape4allseasons@verizon.net.